Cookie and Kryptonite were put in together on 2/17/19 to 3/09/19. Nathan is a dark blue buck owned by Michelle Davis and he was bred to our Mch Pixie. 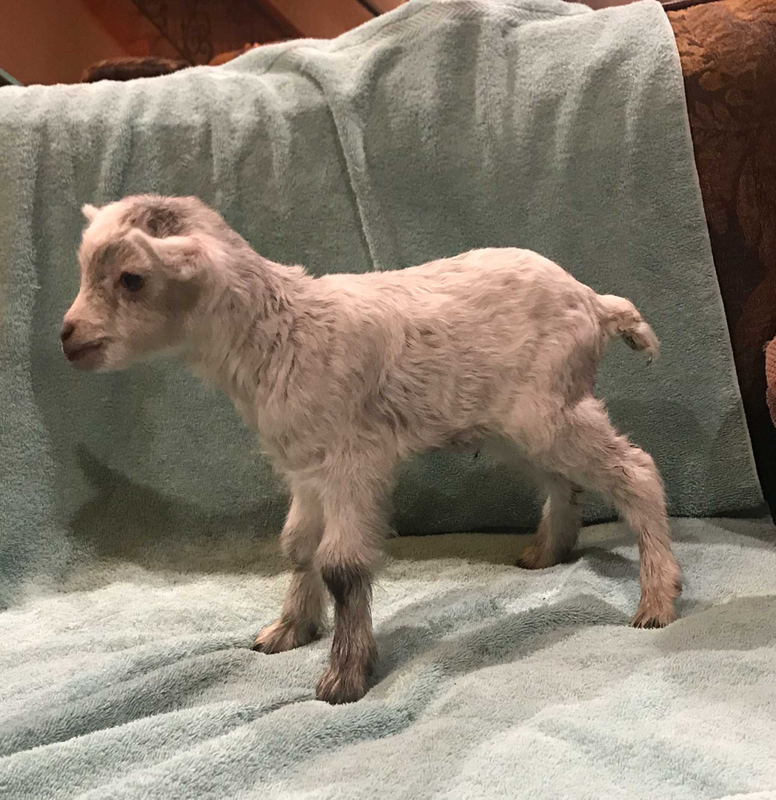 They blessed us with a gorgeous blue, blue eyed buckling on 12/31/18. We named him Ultra Covert Silverthorne. He will be retained for our breeding program. Aislinn Meadoes Venture is a stunning Blue and White buck that is now owned by Nazworthy Acres. 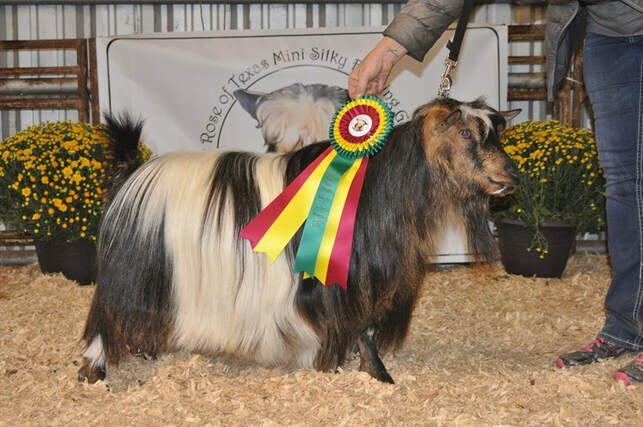 He has 6 Master Champions in his pedigree and his mother has several best in shows. Love Bug has two Master champions in her pedigree. They were bred from 8/21/18 to 9/7/18. 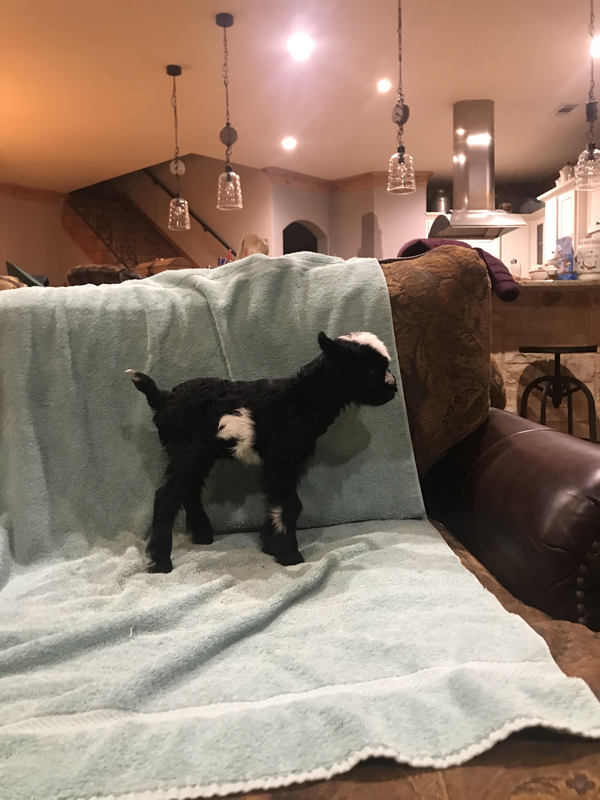 They has a blue doeling named Swan Song on 1/19/19 that we are retaining and a black and white buckling named Chocolate Chip that will be a herdsire in Stephenville. 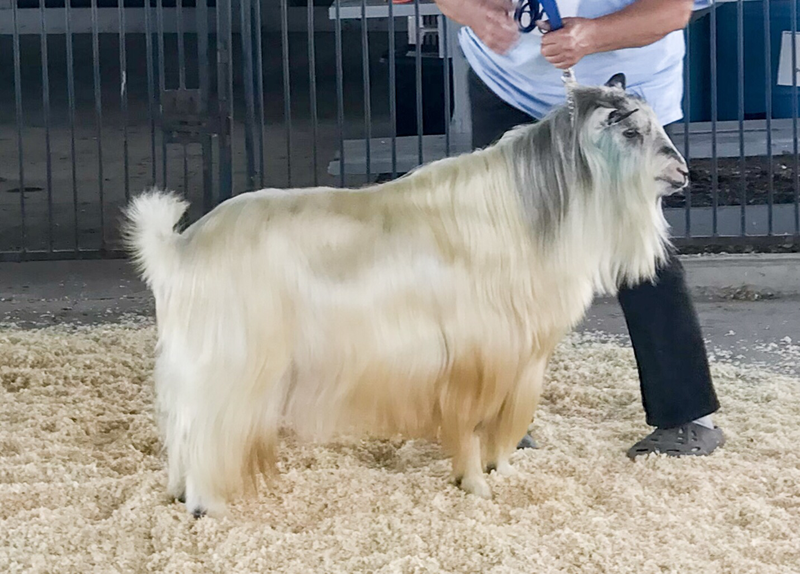 Aislinn Meadows Venture is a super silky blue and white buck with 6 Master Champions in his pedigree. 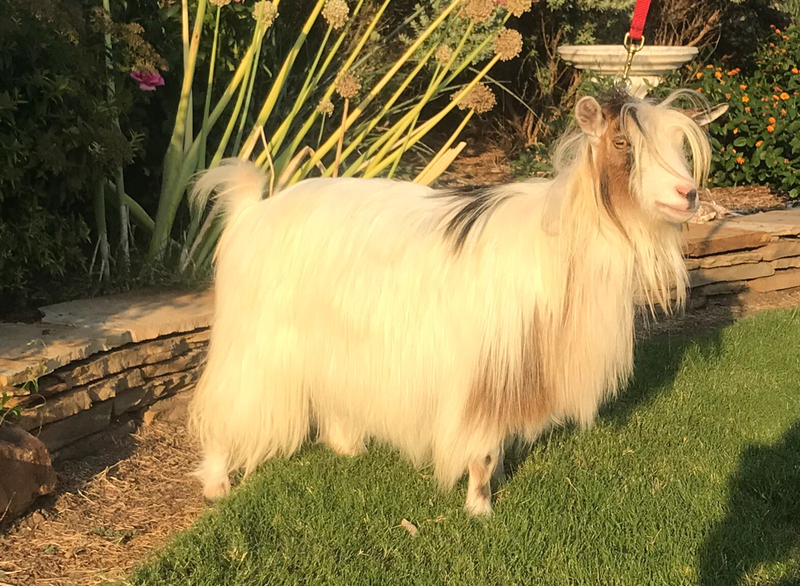 He is bred to Randolph's Izzie Mae, Izzie is a daughter of the two time mini silky of the year, Randolph's Hemingway and MCH Randolph's Eau Claire, plus 6 more Master Chsmpions in her Pedigree. They were breeding from 8/19/18 to 9/9/18. 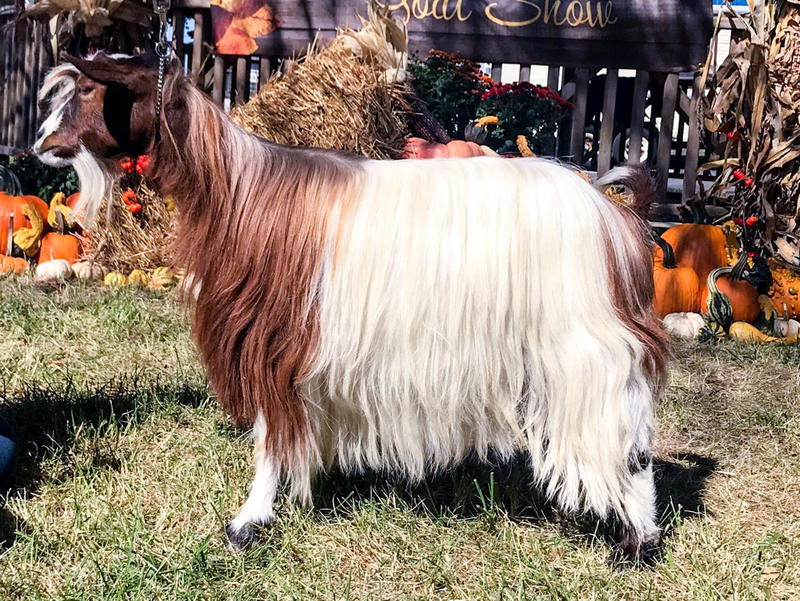 The had a stunning tir colored doeling named Victorious and a gorgeous buckling named Taylor Made. They are both sold. Two babies were born on 1/13/19. We had a tri colored doeling and a blue and white buckling born. 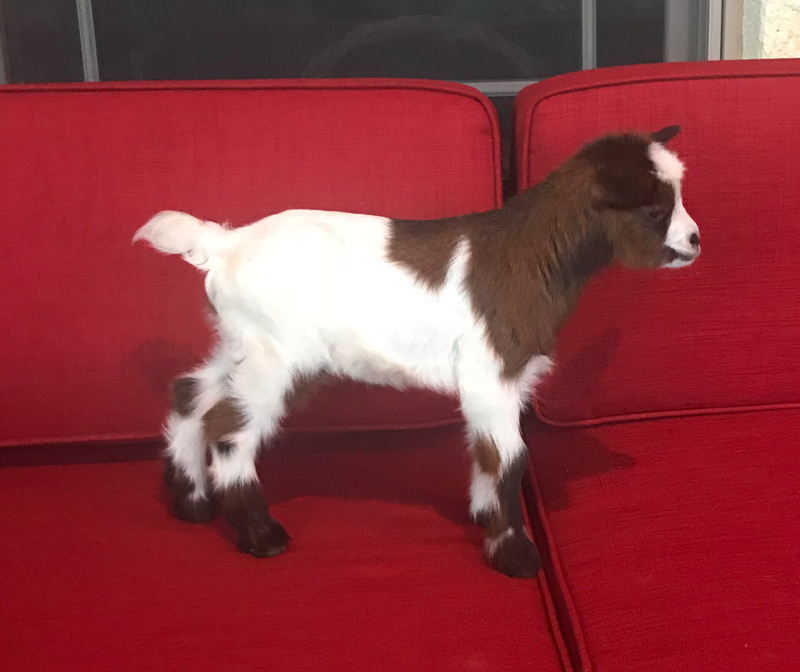 The doeling is named Victorious and will live in College Station. The buckling is named Taylor Made and he will be going to Albuquerque, New Mexico. 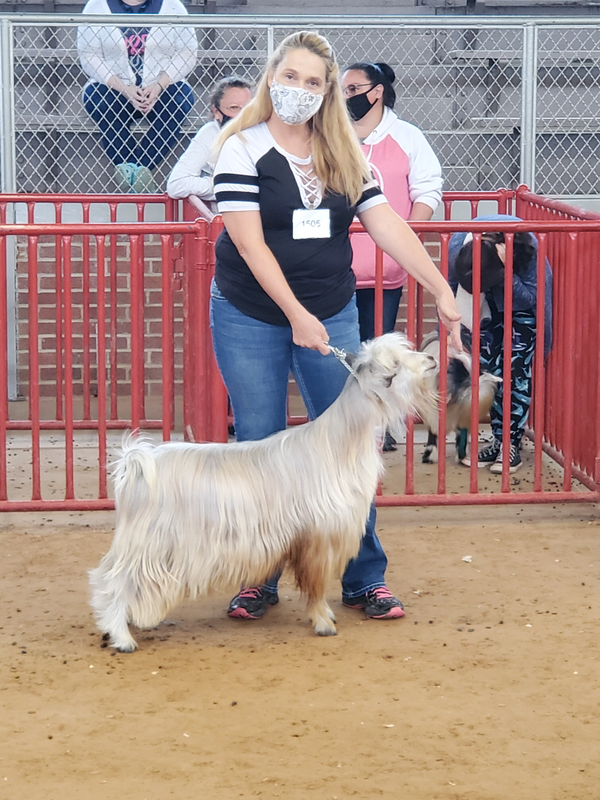 Aislinn Meadows Venture is a gorgeous blue and white buck with 6 master champions in his pedigree. 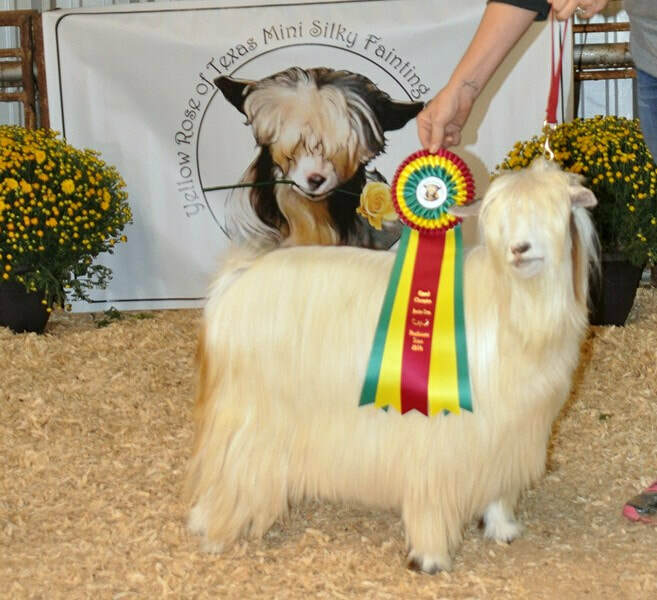 Hill Country Mini's Elsa also has 6 Master Champions in her pedigree, including the two time Mini Silky of the Year, Randolph's Hemingway. They were bred from 8/19/18 to 9/7/18. Elsa graced us with two blue doelings on 1/20/19. Like the Rain will be retained and Play Misty For Me is sold. Aislinn Meadows Venture is a gorgeous blue and white buck with a stellar pedigree. He has 6 Master Champions in his pedigree and has a super silky coat. He is bred to Harper, who is a super stocky doe with a super thick cost. She also has 6 Master Champions in her Pedigree. 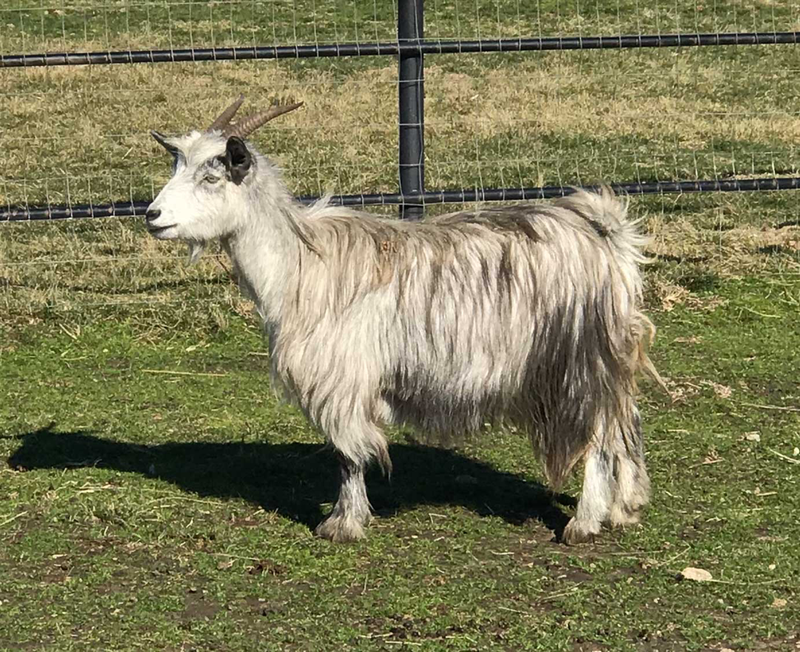 They had one blue and white buckling on 1/19/19 and we named him Blue Ice. He will be retained at this time to see how he develops. Aislinn Meadows Venture is a stunning blue and white buck with 6 Master Champions in his pedigree. 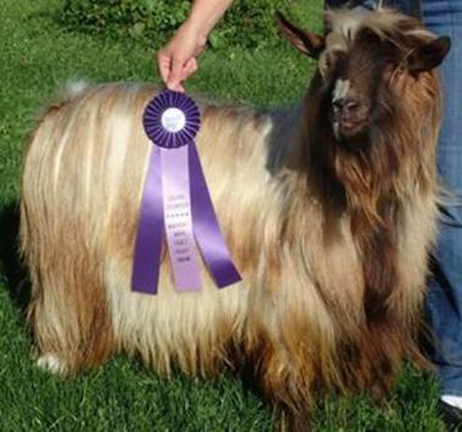 Blue moons is sired by Redneck Acres Blue Chips, who has sired many award winning blue goats. She is a blue roan with a very heavy silky coat and two Master Champions in her pedigree. They were bred from 8/19/18 to 9/07/18. 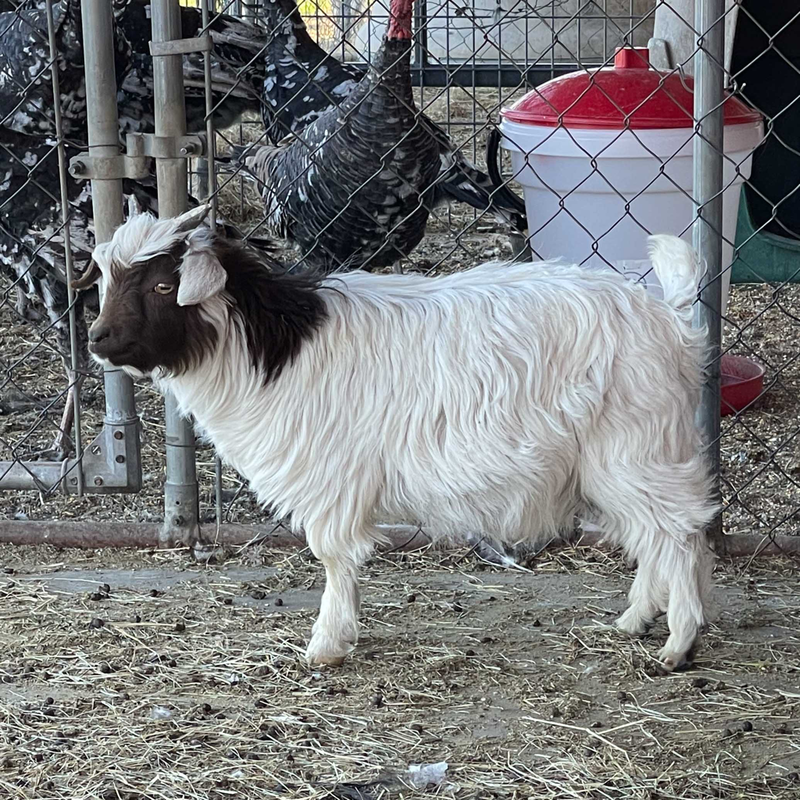 They had a stunning Tiny blue and white buckling on 1/20/19 and we will hold on to him for a bit to evaluate as a herdsire for us. 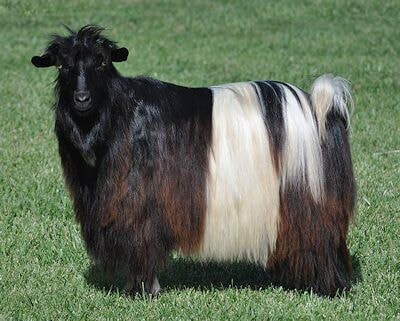 Flying J Fainters Roulette is a very hairy black and white Master Champion with very heavy bone and a super correct legset. He is bred to a beautiful blue and white doe that is a Blue Chips daughter. She has a super soft, thick coat and her pedigree has three Master Champions in it. 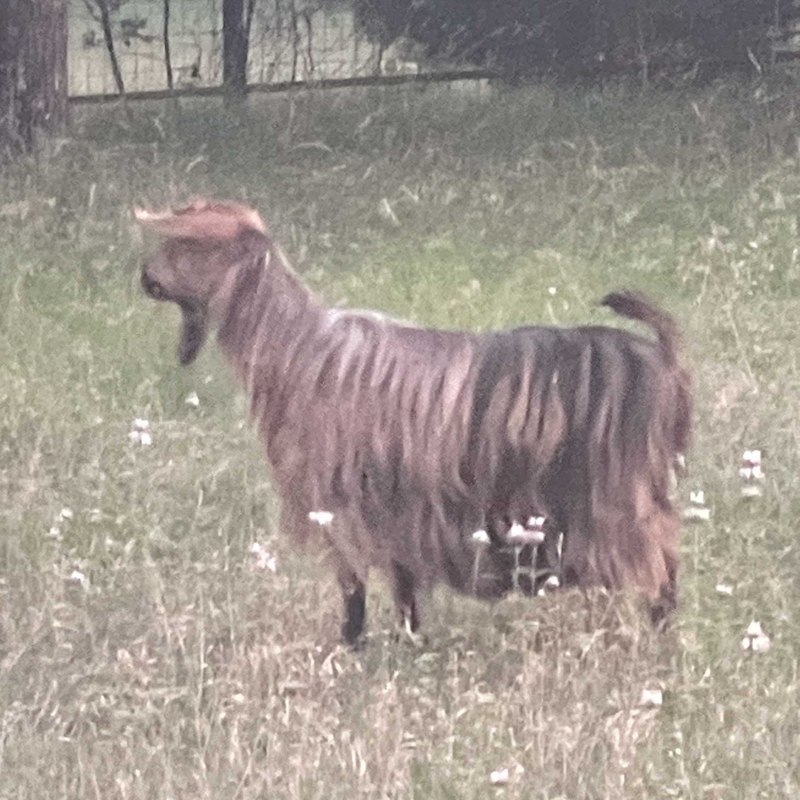 They were bred from 9/17/19 to 9/18/19. Deposit on one buck. Flying J Fainters Kryptonite is a Master Champion with 6 Master Champions in his pedigree. He is bred to Redneck Acres Atta Tude, a stunning doe out of Crystal Geering's breeding program. Atta has super long, silky hair and marbled blue eyes. Atta had two black and white does that we named Smarty Pants and Fancy Pants on 1/20/17 and one tri colored buck that we named L'Attitude. The buck and one doe are sold and one doe will be retained for our breeding program. Atta is 10 now and this will probably be her last kidding. bred 1/6/18 due 6/6/18. They had one doe named Grace and one buckling named Jethro on 6/4/18. 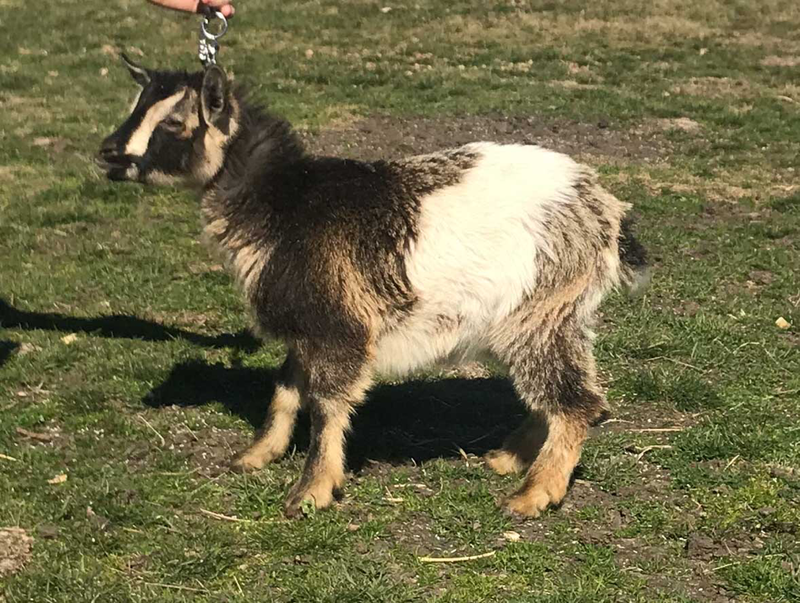 Bravo and Cookie had a stunning Tri colored doeling on 3/19/18. We named her Mustang Sally and she is a keeper. Iila and Kryptonite has two doelings on 2/23/18. One is a rich dark brown with one tiny white spot and one is a solid shiny black with at few white hairs on the tip of her tail plus a small spot on her right flank. They are both sold. 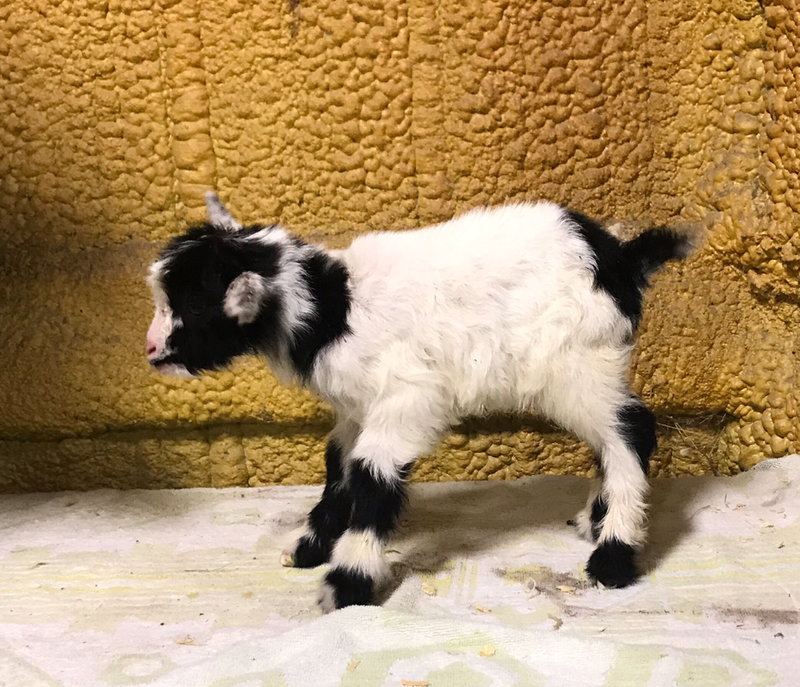 Bravo and Wynd Chyme had a tiny tri colored buckling on May 1, 2018. He was sold to Susan Seiler in Arizona.